The Lost Heroine of District Nursing. If you do a quick search for the history of District Nursing you’ll no doubt discover that William Rathbone’s founded of what is described as the first district nursing service in Liverpool in 1863. If you dig a little deeper you might also unearth the fact that almost forty years before Rathbone’s philanthropic gesture Elizabeth Fry, the well-known prison reformer, set up home nursing services in Brighton after seeing for herself the shocking conditions of the poor. You’ll even read how Florence Nightingale supported the founding of District Nurse Associations throughout the country describing district nursing as “that most important of all its [nursing] branches”. This seems a laudable statement until you learn that as the notable Lady with the Lamp was lamenting in 1867 that “until we have district nursing in London we shall have done nothing even when we have refo rmed all the hospitals and all the workhouses” Ellen Ranyard had already laid the foundation of the first district nurse service in London ten years before. 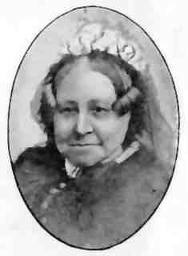 Born in Nine Elms in 1809 Ellen Ranyard, the wife of a non-conformist minister, founded the Bible and Domestic Female Mission in 1857. Unlike many of the mission societies formed at that time instead of utilising middle and upper-class women to further its cause Ellen Ranyard recruited her Biblewomen from the poor working-class communities the Mission was reaching out to. Although very successful in their initial goal of distributing bible tracts to the poor it soon became clear that a practical as well as spiritual dimension was needed so in 1868 the Biblewomen nurses were established. They, too, were poor, working women who after three months training in a London hospital would return to serve their communities as Biblewomen nurses. Although initially based in Covent Garden they soon expanded east to Whitechapel and south to Bermondsey. Their duties included referring patients to doctors and hospitals, inspecting infants in mother’s meetings, and encouraging medical self-help among the poor. 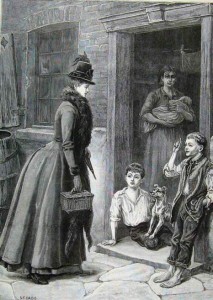 Within 25 years the Bible and Domestic Female Mission had over 80 Biblewoman nurses in London and Ranyard’s Biblewomen nurses continued to operate in South London even after the introduction of the National Health Service but were absorbed into the London borough’s district nursing services in 1965. I discovered Ellen Ranyard when researching my post-war East London District Nurse series and the fictitious St George and St Dunstan’s District Nursing Association in my books is based on the East London Nursing Society founded by Ellen Ranyard’s Biblewomen Nurses Mission in Poplar. Today her fierce evangelical fervour and views on the causes of poverty would be regarded as narrow and bigoted. However, her pragmatic way of ministering to the poor and sick introduced for the first time the model of cultural link-workers used in health promotion work throughout the world today.